Margy and I have been having a wonderful summer and we are getting more and more rested. Our burn-out has subsided and we are ready to take on the next phase of our quilting life. We have been sewing and finishing up the accounting that needed to be done and enjoying our family and friends. Here is a little update. Margy's grandbaby is a living doll and she has grown so much. 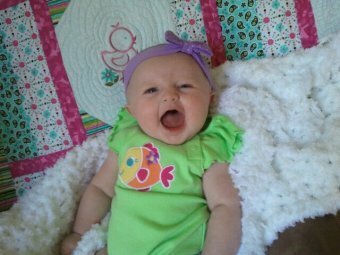 It is shocking with each new picture at how much I see her Dad, Sean, Margy's son in her and she is a happy, smiling baby. Grandma doesn't stop beaming and she already has a perfect set-up for her swinging in Grandma's sewing room. Margy soared this past month over Myrtle Beach with Russ, has spent a great week with her Mom and sister and is getting quite tanned. She is sewing now and enjoying the time she can just sew. For those of you who know my Mom, she is doing much better and in fact we got a good report from the doctor on last Friday. I have been busy working on taking the furniture and stuff home to my house and rearranging my sewing area. We are awaiting electrical work so the process can continue. Also, attended the Longest Yard Sale that runs from Alabama to Michigan. Judie, Eyvonne and I did Alabama, Tennessee and Kentucky and visited Pleasant Hill, the fabulous Shaker Village in KY. I will be attending a dream come true in early October with a Quilt Design Week with Ruth McDowell and I am also going to get to visit my brother and his family in Massachusetts and Maine. The seminar is in Historic Deerfield and I am thrilled to be returning there. All is good. I am loving having time to sew. We are opening our Internet Shoppe on September 14th where you will see some of what we have done and more will be coming. It will be found on our Website at www.jampatch.com. We will be sending you a reminder with more important information close to next Wednesday. It will be worth you while to visit and buy. There will be kits, fabrics (never seen in the store), patterns, books, etc. We have started our up and coming events calendar. Here are some of the activities we have planned. The bargains will knocks your socks off. Wow, that just made me tired,thinking about it. We are also considering a Wool Club that would gather once a month and learn more about these wonderful applique quilts and projects. I have been doing Sue Spargo's BOM in wool this year and boy I am having a blast. We are also considering Crazy Quilting and Embroidery. Let us know at info@jampatch.com with an email and we will include you in any plans. We have a Facebook page and if you like us.....you can really keep up to dat. Who knows what we will do there!!!!!!! Here is a link. www.facebook.com/pages/The-JaM-Patch/141266432583871 LIKE US!!!!!!! Thank you again for your patronage over the years and we will enjoy seeing all of you again at any of the happenings. 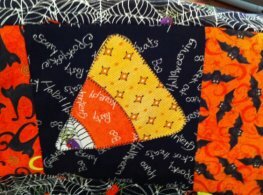 Have a great day sewing and did you remember ......it is CANDY CORN TIME.